Kim Saha, British Athletics Physio & Pilates Instructor gives us her view on Pilates for runners. I am very aware that promoting Pilates to the average runner is like an uphill struggle! It is however so massively beneficial that it is a battle worth fighting! Most runners at some point in their journey will have been told to do Pilates to either become more mobile, more stable or generally stronger. I’m sure almost all runners are advised to cross-train and certainly most of the running community understand that a strong core will help reduce injuries and increase performance. So if its so obvious that Pilates would significantly help your running what’s stopping you? Well – runners love running! That’s why you do it right? So therefore any other form of exercise no matter how beneficial is basically taking you away from what you love doing. Anything that slows you down and requires you to be mindful and focused does not quite fit into your idea of exercise. The reason most of you run is to clear your head not fill it with positioning and breathing techniques. Finally, I think the word Pilates conjures up some kind of ‘yummy mummy’ image for most runners. Along with the belief that it would not be challenging enough. It is my mission to change these views! Not because they are not true, but because I think Pilates needs to be performed slightly differently if runners are going to take it up and benefit from its extremely powerful effects. Let me break this down and tell you how I have combatted each of these mental blocks. If runners love running the classes must challenge you just as much if they are to be found beneficial, they must be enjoyable and produce the same endorphins so that you are drawn to it in the same way. To do this you can add HiiT (High Intensity Interval Training) to the Pilates moves. These exercises are running related like fast feet / mountain climber / jumping lunges and are paired with a relevant Pilates exercise in between. Take a look at this HiiT-Pilates Workout and give it a go! Classes must be fun and dynamic enough that the stresses of the day can be forgotten. Granted it is a different mechanism but believe me that when focusing on form, posture and specific muscle contraction there is no space in your head for the day’s worries! Try this Standing Pilates before you run and see how it benefits your running technique. I have a challenge for you, if you think Pilates is a matter of lying on your back floating your arms and legs around then you need to just give it a go! 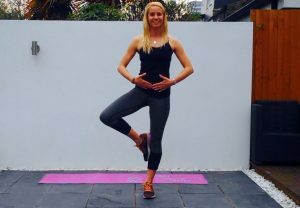 My Pilates for Athletes Part 1 is essentially an intensive continuous abs and glutes circuit that will give your abs a burn like never before; but in the functional way in order to stabilise your spine increasing the power you can create through your limbs. Ideally I encourage one quick Pilates session after a run and one HiiT-Pilates session weekly and who knows what you may achieve? Faster times, reduced muscle soreness? Less injury?